The collapse of the Communist Bloc in 1989-1991 is viewed as one of the great triumphs of the human rights movement. But this ignores how socialist elites of the Eastern Bloc viewed themselves: not as the villains in the story of human rights, but as the champions. In recent years, the rapidly expanding field of human rights history has done much to complicate triumphalist narratives of inevitable victory for Western liberal democracy over the forces of tyranny. Recent collections including those edited by Stefan-Ludwig Hoffmann, Jan Eckel and Samuel Moyn, have opened up new lines of inquiry exposing not only the contingency of these ideas, but also the conflicts amongst those claiming the mantle of universal human rights. On this blog in recent weeks, Fabian Klose has examined the important role of decolonization and post-colonial states in shaping the development of human rights politics, and Robert Brier has interrogated the idea of human rights as a product of neo-liberalism in the context of the Polish opposition. Here, I want to look beyond the human rights campaigns of dissident Eastern Europeans to that of the states they fought against. 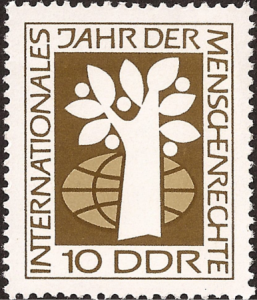 One of a number of East German postage stamps commemorating International Human Rights Year 1968. The hammer and anvil represent the right to work. 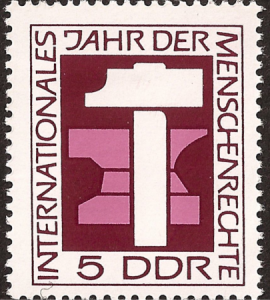 While state socialism is normally seen as the definitional opponent of human rights – rejecting individual autonomy, independent justice, free elections, free speech and free practice of religion – the elites of the Eastern Bloc claimed that they were actually the true representatives of human rights. For them, the revolutionary victory over capitalism meant the end of class conflict and the abolition of the “exploitation of man by man.” The creation of a socialist society overcame the horrific abuses of the capitalist system, including war, imperialism and racism. Another stamp commemorating International Human Rights Year 1968. The tree and globe represent the right to life. When such rhetoric from the Eastern Bloc has been noted in histories of the Cold War, it is usually dismissed as a crude and cynical attempt to deflect Western criticism, particularly after the signing of the Helsinki Accords in 1975. That is, once the communist states were compelled to affirm the idea of human rights, they simply had to adjust their rhetoric in a desperate attempt to fend off protest from within and without. These narratives are undermined, however, by the fact that state socialist elites were using the language of human rights well before Helsinki – the quote above from Karl Polak dates to 1946. In Hungary, the first scholarly work on human rights and socialism was written by legal scholar Imre Szabo in 1948. As Jennifer Amos and Daniel Whelan have demonstrated, the Soviet Union was an active player in the human rights diplomacy of the 1950s. 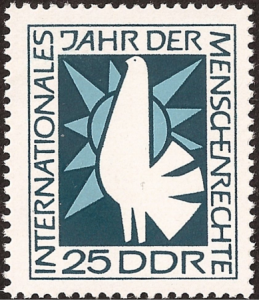 Such early efforts weren’t just rhetorical or academic: the German Democratic Republic formed the Committee for the Protection of Human Rights to campaign against abuses by the West and to mobilize citizens to campaign against the imprisonment of communists and peace activists in West Germany. Founded in 1959, this group predates the creation of Amnesty International by two years. With the change in majorities in the bodies of world organizations – particularly in the [UN] General Assembly – the socialist states have recognized the possibility of the politicization of human rights, and the free world has almost cleared off the field without a fight: the US by its human rights abstinence, the Western European countries by their regionalism. While the Helsinki Accords are now often portrayed as a coup for the West in “forcing” the East to accept terms that would eventually lead to its downfall, at the time, the idea of human rights was hardly seen as a devastating ideological weapon. 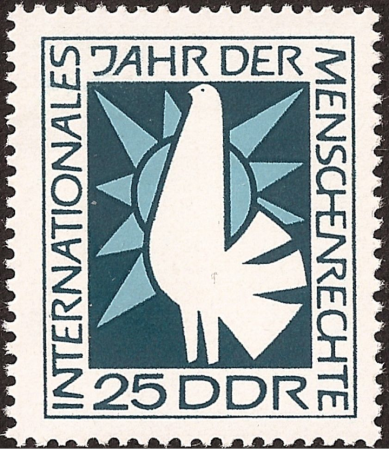 The dove representing right to peace. 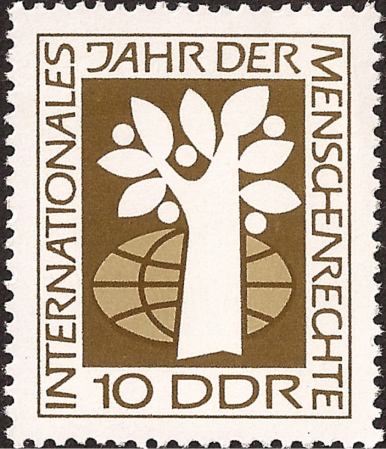 Including the perspective of state socialist leaders and elites is crucial to understanding human rights diplomacy in the post-war era. Such ideas and politics also were crucial to state socialist rule and influenced the development of dissident and opposition movements, as I have recently argued, along with Benjamin Nathans, Paul Betts, and Mark Smith and others. Celia Donert’s recent work similarly demonstrates how the explosion of women’s rights as human rights in 1990s can be in part traced back to the transnational feminism organized through Eastern Bloc organizations and events that have been dismissed as mere propaganda for communism. Rather than simply seeing the rise of human rights movements in the East as a direct importation from the West, this new scholarship shows how 1989 was also connected to the evolution of indigenous right cultures that were initially fostered by the state. This line of inquiry is not only valuable to the study of the Cold War and its end, but also to explaining the development of human rights politics in the post-socialist period. In challenging liberal Western triumphalism, it is also vital to consider the perspectives of the socialist East. The appropriation of the idea of human rights by non-liberal and even dictatorial states is no relic of Cold War dynamics long since departed, but is continuing to this day in Iran and North Korea. In grappling with the developments of 1989, political scientist Peter Juliver argued that one had to begin a process of “rethinking rights without the enemy.” I would argue that in order to do so, we first must rethink the history of human rights including the “enemies,” and not just the victors. Karl Polak, “Gewaltteilung, Menschenrechte, Rechtsstaat: Begriffsformalismus und Demokratie,” Einheit 7 (December 1946): 138. For the main work asserting the discontinuous effect of Helsinki Accords for the Eastern Bloc, see Daniel Thomas, The Helsinki Effect: International Norms, Human Rights, and the Demise of Communism (Princeton UP, 2001) as well as Michael Ignatieff, Human Rights as Politics and Idolatry, University Center for Human Values series (Princeton UP, 2001), 19, which argues that the Eastern Bloc denied the validity of political and civil human rights prior to Helsinki. Imre Szabo, Az emberi jogok mai értelme, (Budapest: Hungária, 1948). Dieter Blumenwitz. “Selbstbestimmung und Menschenrechte im geteilten Deutschland aus der Sicht der Konferenz für Sicherheit und Zusammenarbeit in Europa,” 11. This entry was posted in Articles and tagged Helsinki, Human Rights, Socialism by Fabian Klose. Bookmark the permalink.